Acker appears to have taken a bad fall down an icy slope near Pyramid Peak. Police chief Jamie Sunderland says there were clear signs of trauma when they recovered her today. “It does appear from the evidence at the scene that this apparent fall was a major factor in her death,” Sunderland said. A search team spotted Acker Monday, but police and the Coast Guard couldn’t retrieve her body and confirm her identity at the time due to rough weather and low visibility. Sunderland says a foot and a half of snow fell around Pyramid overnight. And conditions were still treacherous when public safety, the Coast Guard and a civilian guide went back to the scene this morning. Pyramid is a 2,300-foot-tall peak surrounded by miles of popular hiking trails above Unalaska’s Captain’s Bay. That’s where Westward Seafoods is located. Acker worked there as a seasonal fisheries observer. She was a groundfish technician with the state Department of Fish & Game in Sitka during the rest of the year. But Sunderland says she had spent time in Unalaska before. He says Acker had told a friend a few days before that she wanted to check out an area near the Icy Creek reservoir, about 30 minutes off the trail. There’s no cell service there, and even radio reception is patchy. A search crew reached the spot by snowmachine and on foot to bring Acker back to Unalaska. Police have been in touch with her family in Wisconsin. Her body is will be sent to the state medical examiner in Anchorage for an autopsy. 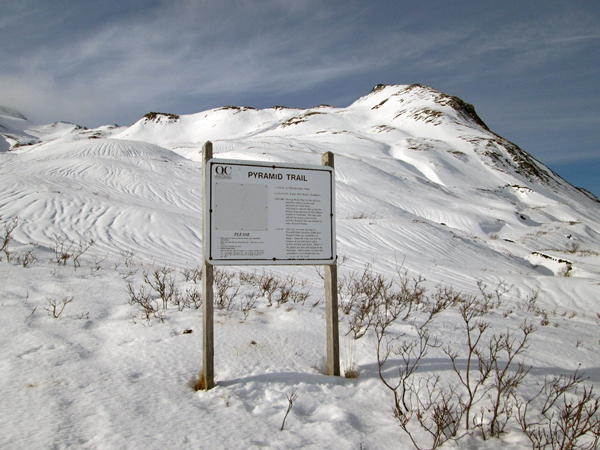 Hiking-related deaths are rare in Unalaska. The last one on Pyramid was 20 years ago, when a visiting Coast Guard sailor took a fatal fall from a cliff high up on the mountain.